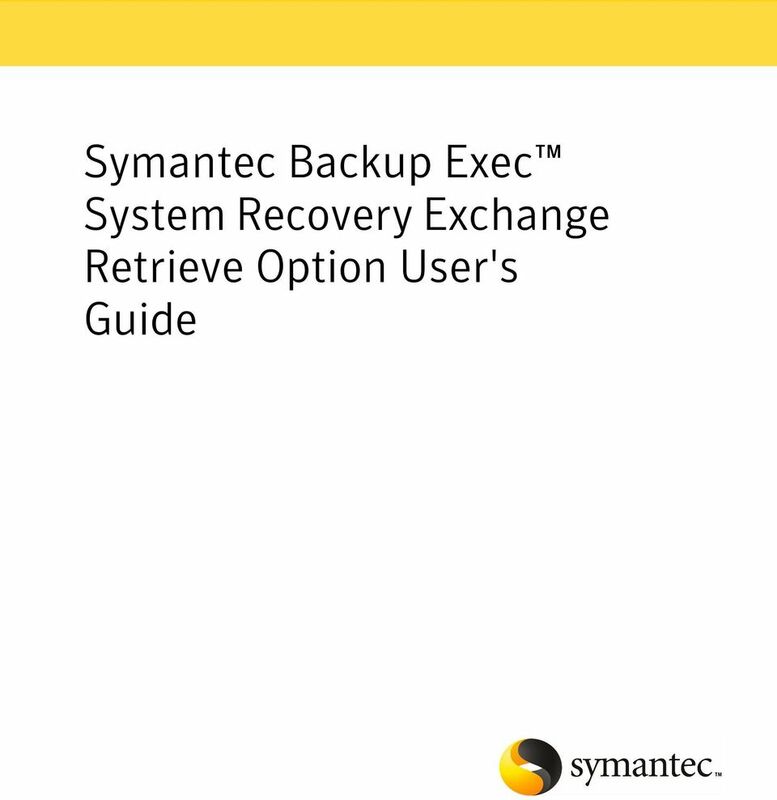 Download "Symantec Backup Exec System Recovery Exchange Retrieve Option User's Guide"
3 Technical Support Contacting Technical Support Symantec Technical Support maintains support centers globally. Technical Support s primary role is to respond to specific queries about product feature and function, installation, and configuration. The Technical Support group also authors content for our online Knowledge Base. The Technical Support group works collaboratively with the other functional areas within Symantec to answer your questions in a timely fashion. For example, the Technical Support group works with Product Engineering and Symantec Security Response to provide alerting services and virus definition updates. Symantec s maintenance offerings include the following: A range of support options that give you the flexibility to select the right amount of service for any size organization A telephone and web-based support that provides rapid response and up-to-the-minute information Upgrade insurance that delivers automatic software upgrade protection Global support that is available 24 hours a day, 7 days a week worldwide. Support is provided in a variety of languages for those customers that are enrolled in the Platinum Support program Advanced features, including Technical Account Management For information about Symantec s Maintenance Programs, you can visit our Web site at the following URL: Select your country or language under Global Support. The specific features that are available may vary based on the level of maintenance that was purchased and the specific product that you are using. Customers with a current maintenance agreement may access Technical Support information at the following URL: Select your region or language under Global Support. Before contacting Technical Support, make sure you have satisfied the system requirements that are listed in your product documentation. Also, you should be at the computer on which the problem occurred, in case it is necessary to recreate the problem. 5 Advice about Symantec's technical support options Nontechnical presales questions Issues that are related to CD-ROMs or manuals Maintenance agreement resources Additional Enterprise services If you want to contact Symantec regarding an existing maintenance agreement, please contact the maintenance agreement administration team for your region as follows: Asia-Pacific and Japan: Europe, Middle-East, and Africa: North America and Latin America: Symantec offers a comprehensive set of services that allow you to maximize your investment in Symantec products and to develop your knowledge, expertise, and global insight, which enable you to manage your business risks proactively. Enterprise services that are available include the following: Symantec Early Warning Solutions Managed Security Services Consulting Services Educational Services These solutions provide early warning of cyber attacks, comprehensive threat analysis, and countermeasures to prevent attacks before they occur. These services remove the burden of managing and monitoring security devices and events, ensuring rapid response to real threats. 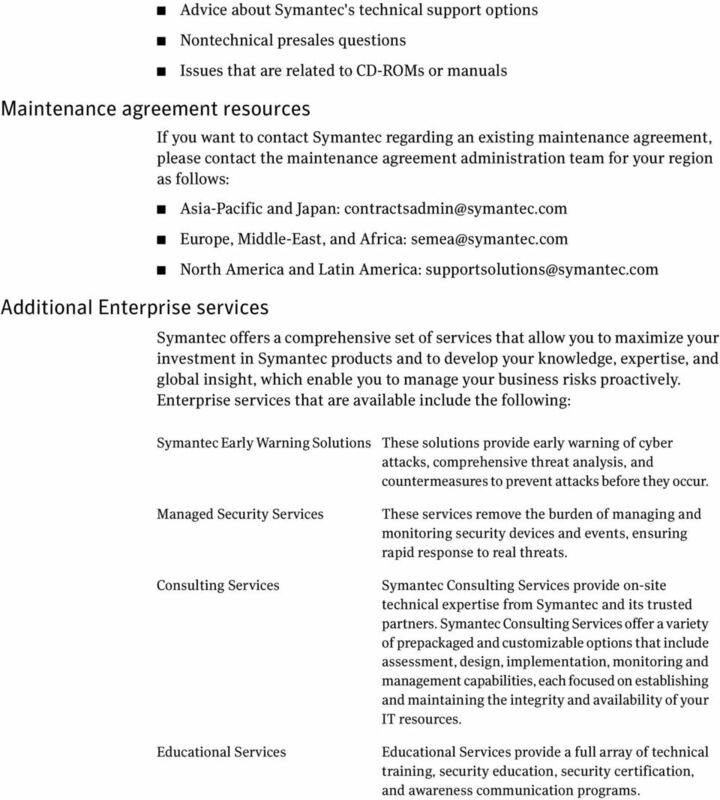 Symantec Consulting Services provide on-site technical expertise from Symantec and its trusted partners. Symantec Consulting Services offer a variety of prepackaged and customizable options that include assessment, design, implementation, monitoring and management capabilities, each focused on establishing and maintaining the integrity and availability of your IT resources. Educational Services provide a full array of technical training, security education, security certification, and awareness communication programs. 6 To access more information about Enterprise services, please visit our Web site at the following URL: Select your country or language from the site index. 11 Introducing the Symantec Backup Exec System Recovery Exchange Retrieve Option Best practices when creating recovery points for use with the Backup Exec Exchange Retrieve Option 11 Select the option to back up your computer, not the option to back up selected files and folders. When you select which drives to back up, make sure that you select all of the drives on your Exchange server. 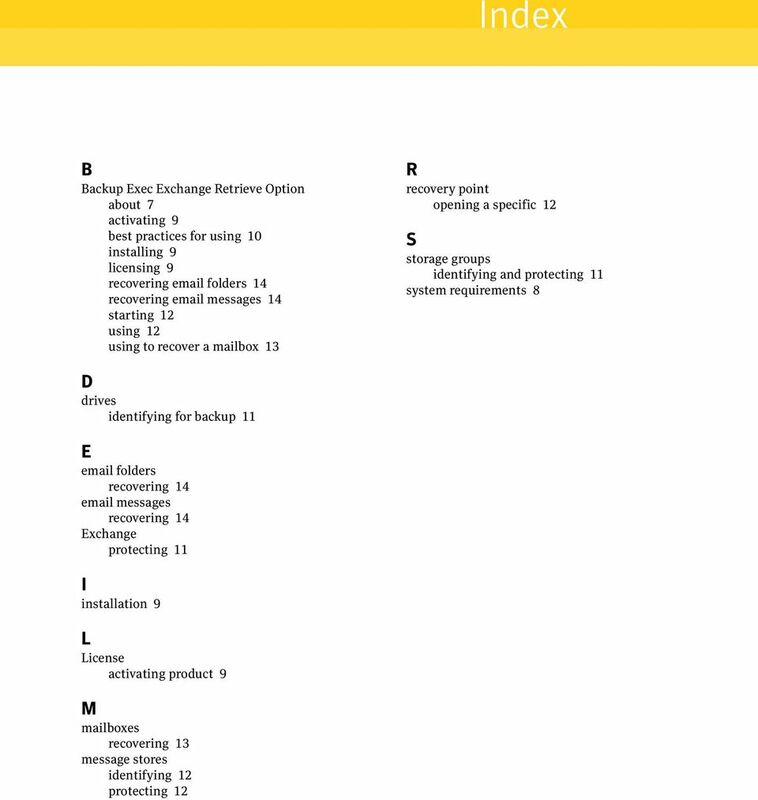 See Identifying drives for backup on page 11. When you select the type of recovery point to create, you should select Recovery Point Set instead of Independent Recovery Point. This selection makes subsequent recovery points much smaller. The Exchange server does not need to be shut down for a backup to run successfully. However, you should schedule the backup at a time when the server will be less busy (for example, after midnight). Identifying drives for backup The recommended way to protect your Exchange server is to create a single backup job that contains all of the drives on your server. However, you can choose to run your backups at the storage group and message store levels. You should consider the following in order to ensure a successful backup: Include the drive that contains your Exchange installation Exchange Retrieve uses the recovery point of the Exchange server to perform the restore operation. Therefore, you should routinely back up your Exchange server. 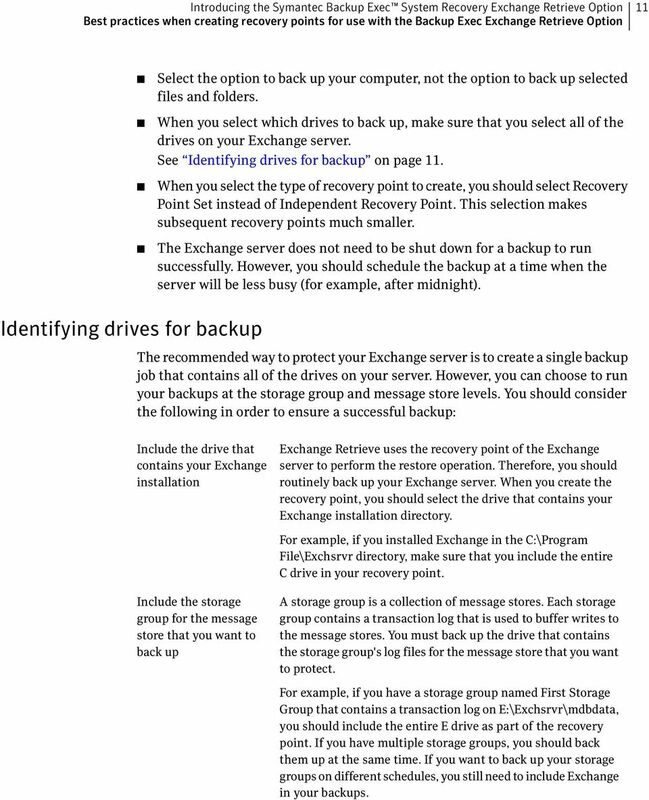 When you create the recovery point, you should select the drive that contains your Exchange installation directory. For example, if you installed Exchange in the C:\Program File\Exchsrvr directory, make sure that you include the entire C drive in your recovery point. Include the storage group for the message store that you want to back up A storage group is a collection of message stores. Each storage group contains a transaction log that is used to buffer writes to the message stores. You must back up the drive that contains the storage group's log files for the message store that you want to protect. For example, if you have a storage group named First Storage Group that contains a transaction log on E:\Exchsrvr\mdbdata, you should include the entire E drive as part of the recovery point. If you have multiple storage groups, you should back them up at the same time. If you want to back up your storage groups on different schedules, you still need to include Exchange in your backups. 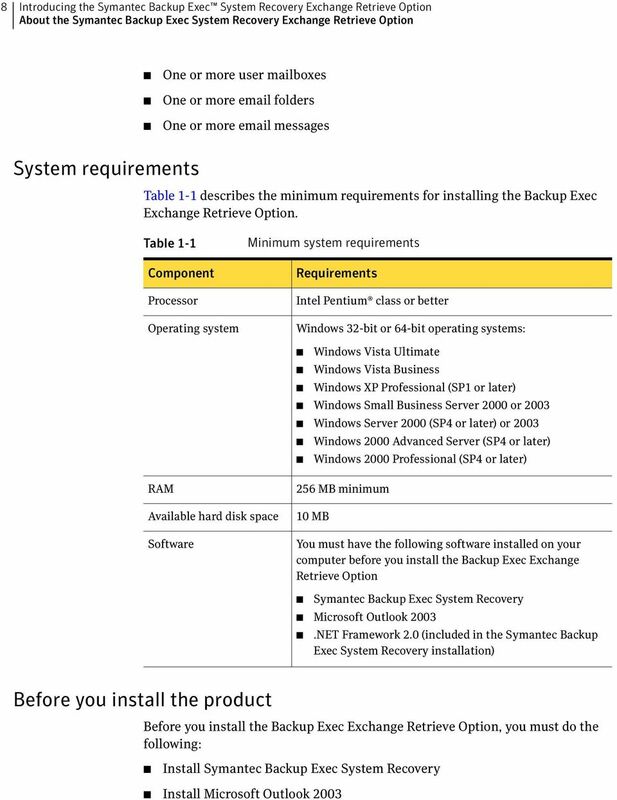 12 12 Introducing the Symantec Backup Exec System Recovery Exchange Retrieve Option Starting the Backup Exec Exchange Retrieve Option Include the message stores you want to protect A message store is a database file that stores . Message stores are subgroups of storage groups. When you create a recovery point for a message store, you must also include its storage group. For example, if you have a message store named Message Store (myserver) that is located on F:\Exchsrvr\mdbdata\Message Store (myserver).stm, you should include the entire F drive in your recovery point. 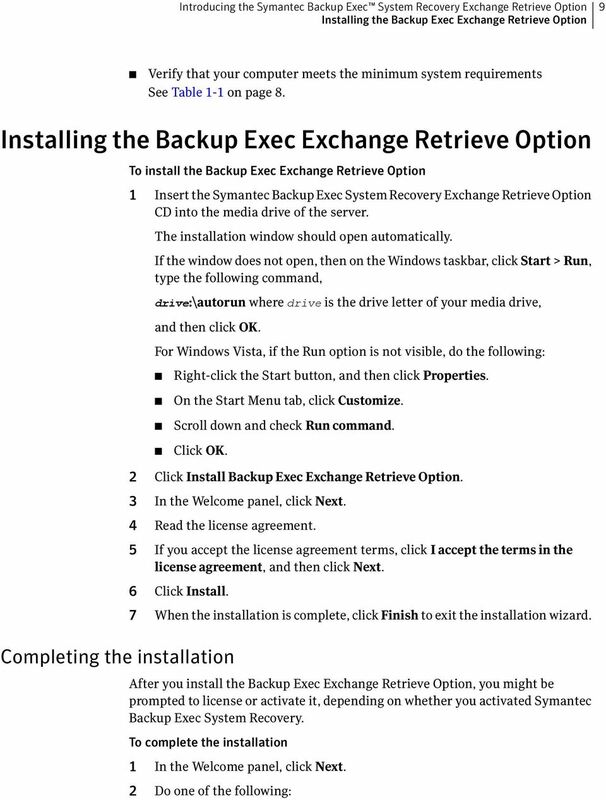 Starting the Backup Exec Exchange Retrieve Option To start the Backup Exec Exchange Retrieve Option Do one of the following: On the classic Windows taskbar, click Start > Programs > Symantec > Backup Exec Exchange Retrieve Option > Recovery. On the Windows 2003, Windows XP, or Windows Vista taskbar, click Start > All Programs > Symantec > Backup Exec Exchange Retrieve Option > Recovery. 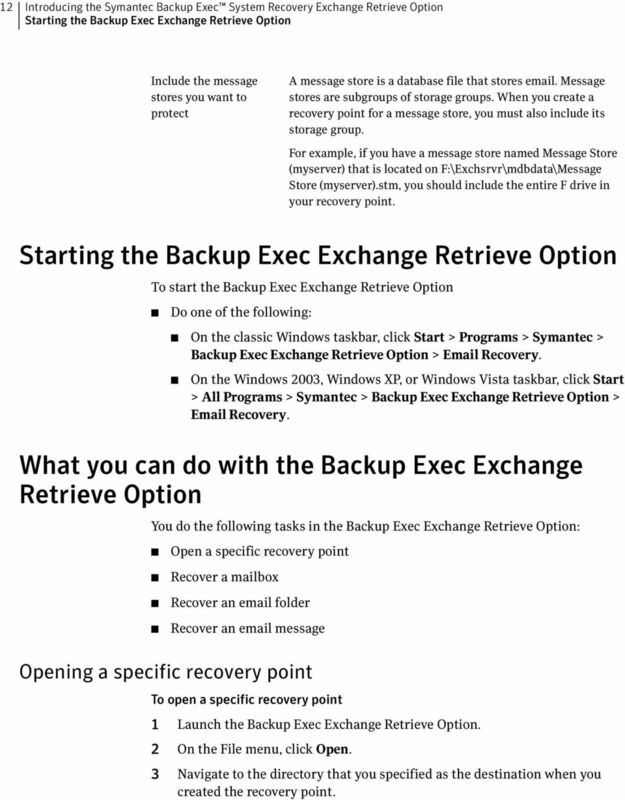 What you can do with the Backup Exec Exchange Retrieve Option You do the following tasks in the Backup Exec Exchange Retrieve Option: Open a specific recovery point Recover a mailbox Recover an folder Recover an message Opening a specific recovery point To open a specific recovery point 1 Launch the Backup Exec Exchange Retrieve Option. 2 On the File menu, click Open. 3 Navigate to the directory that you specified as the destination when you created the recovery point. 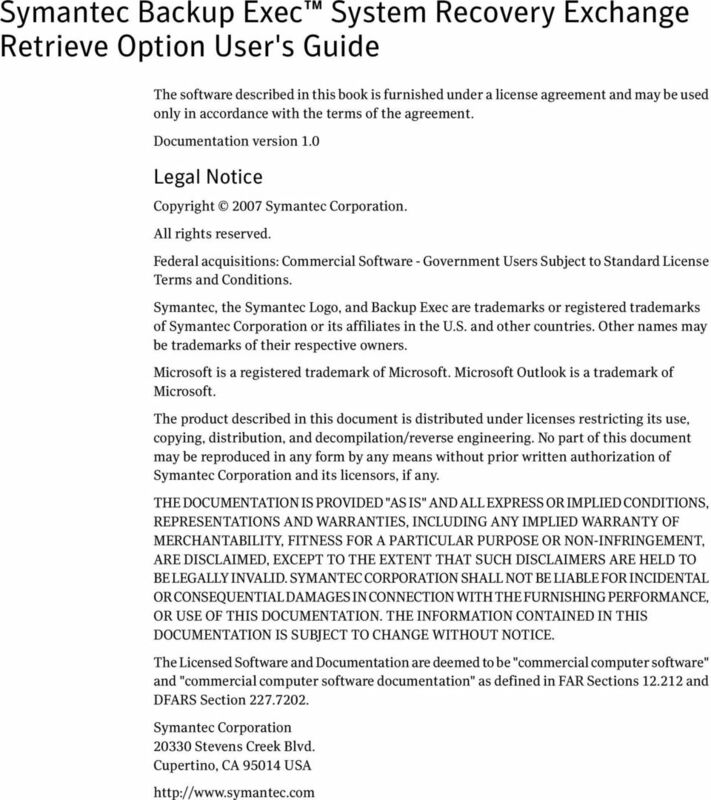 13 Introducing the Symantec Backup Exec System Recovery Exchange Retrieve Option What you can do with the Backup Exec Exchange Retrieve Option 13 Recovering a mailbox 4 Select a file that has an.sv2i extension to view the contents of a recovery point. It may take several minutes to open the recovery point. 5 After the recovery point opens, from the pull-down menu on the toolbar, select the date. For example, if a user has lost an message, but isn't sure when, you should look at the older dates first. A message does not change once it is stored on the server, so an older copy will be the same as a newer one. Each date represents a single recovery point. When you select a date, the Backup Exec Exchange Retrieve Option displays a snapshot of the Exchange server. It can take several minutes for information to display. 6 Select the Store and Group you want from the pull-down menus on the toolbar. If your Exchange server only has one storage group and one message store, skip this step. The storage group and message store are selected by default. If you cannot remember which storage group and message store a user belongs to, you can use Active Directory to expedite your search. A recovered mailbox contains all of the that was contained in the user's mailbox when the recovery point was created. A recovered mailbox is saved on the disk as a PST file. You can use Microsoft Outlook to open and view the contents of the file. You can optionally drag and drop messages in Outlook from the recovered mailbox to your Exchange server. Note: In many cases, it is easier to restore a user's entire mailbox than find a single message. 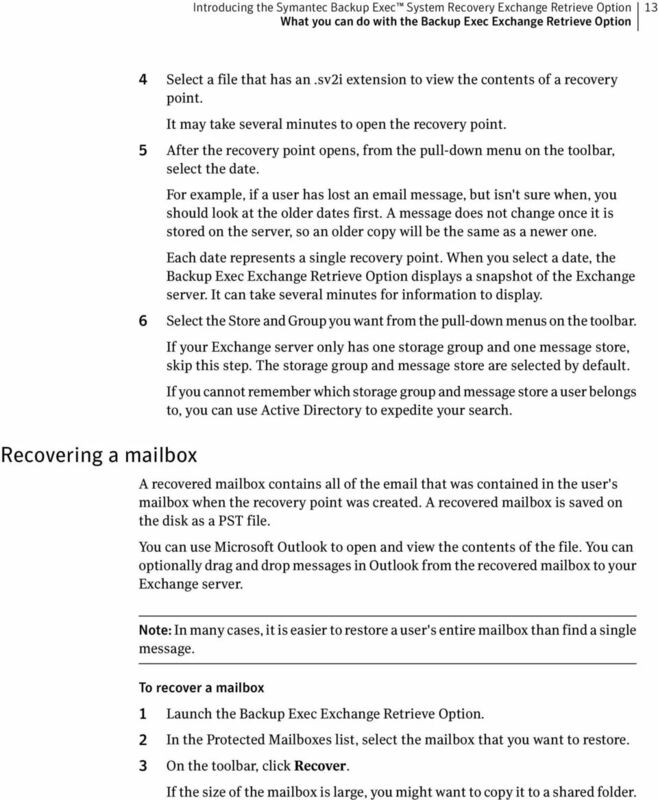 To recover a mailbox 1 Launch the Backup Exec Exchange Retrieve Option. 2 In the Protected Mailboxes list, select the mailbox that you want to restore. 3 On the toolbar, click Recover. If the size of the mailbox is large, you might want to copy it to a shared folder. 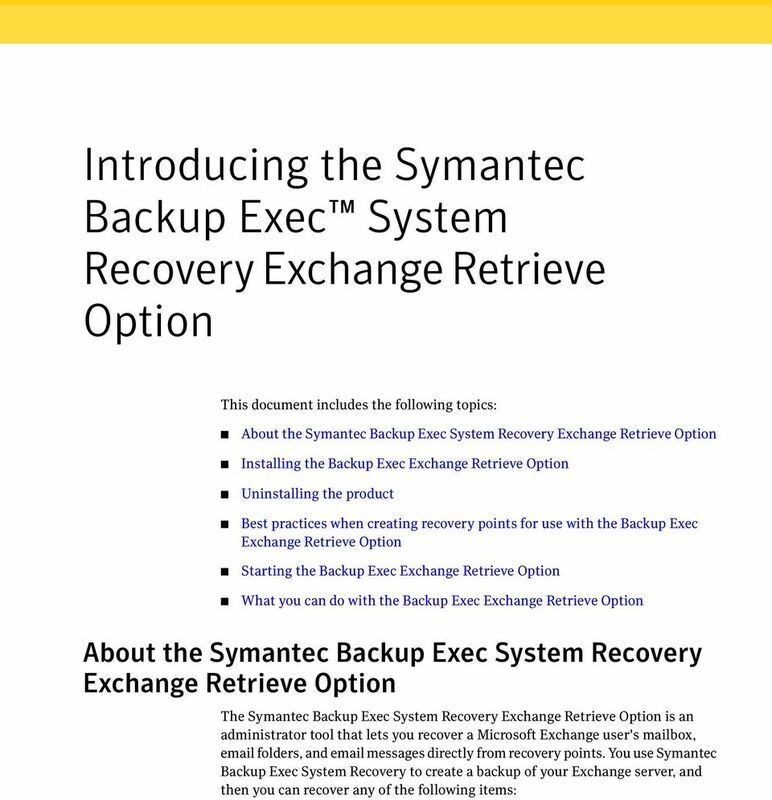 14 14 Introducing the Symantec Backup Exec System Recovery Exchange Retrieve Option What you can do with the Backup Exec Exchange Retrieve Option Recovering an folder You can recover a single folder instead of an entire mailbox. For example, if a user needs a copy of a sent message, it is quicker to recover only the Sent Items folder. A recovered folder is saved on the disk as a PST file. You can use Microsoft Outlook to open and view the contents of the folder. 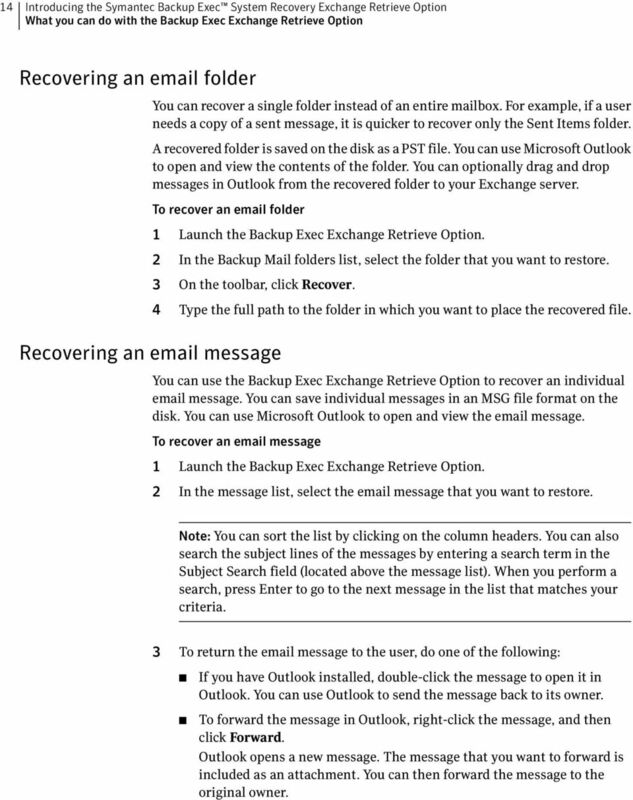 You can optionally drag and drop messages in Outlook from the recovered folder to your Exchange server. To recover an folder 1 Launch the Backup Exec Exchange Retrieve Option. 2 In the Backup Mail folders list, select the folder that you want to restore. 3 On the toolbar, click Recover. Recovering an message 4 Type the full path to the folder in which you want to place the recovered file. You can use the Backup Exec Exchange Retrieve Option to recover an individual message. You can save individual messages in an MSG file format on the disk. You can use Microsoft Outlook to open and view the message. To recover an message 1 Launch the Backup Exec Exchange Retrieve Option. 2 In the message list, select the message that you want to restore. Note: You can sort the list by clicking on the column headers. You can also search the subject lines of the messages by entering a search term in the Subject Search field (located above the message list). When you perform a search, press Enter to go to the next message in the list that matches your criteria. 3 To return the message to the user, do one of the following: If you have Outlook installed, double-click the message to open it in Outlook. You can use Outlook to send the message back to its owner. To forward the message in Outlook, right-click the message, and then click Forward. Outlook opens a new message. The message that you want to forward is included as an attachment. You can then forward the message to the original owner. 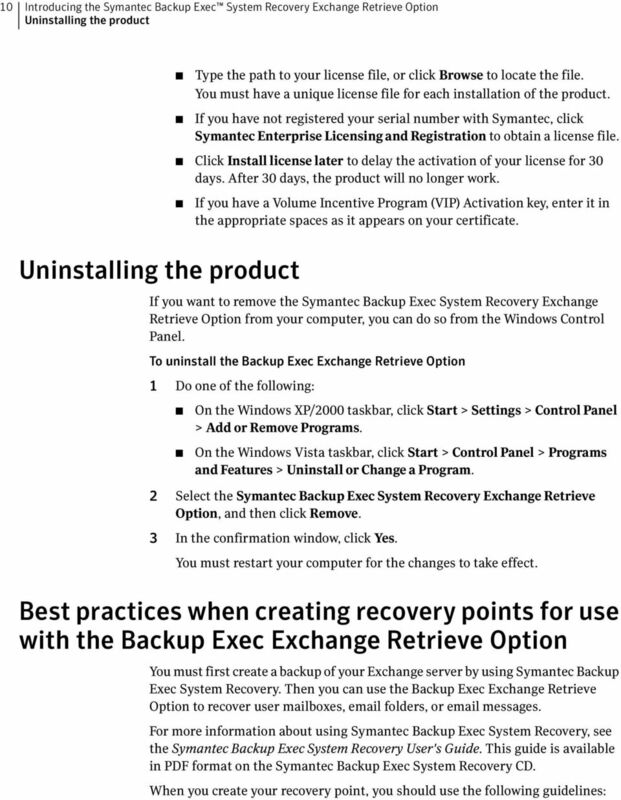 15 Introducing the Symantec Backup Exec System Recovery Exchange Retrieve Option What you can do with the Backup Exec Exchange Retrieve Option 15 To save the message to a disk, select the message, and then on the toolbar, click Recover. Type the filename, and then click Save. The message is saved on the disk. You can use Outlook to open the message.